Vigna radiata, which is classified in the family Fabaceae, is an important economic crop and a dietary staple in many developing countries. The species radiata can be further subdivided into varieties of which the variety sublobata is currently acknowledged as the putative progenitor of radiata. EcoTILLING was employed to identify single nucleotide polymorphisms (SNPs) and small insertions/deletions (INDELS) in a collection of Vigna radiata accessions. A total of 157 DNA polymorphisms in the collection were produced from ten primer sets when using V. radiata var. sublobata as the reference. The majority of polymorphisms detected were found in putative introns. The banding patterns varied from simple to complex as the number of DNA polymorphisms between two pooled samples increased. Numerous SNPs and INDELS ranging from 4–24 and 1–6, respectively, were detected in all fragments when pooling V. radiata var. sublobata with V. radiata var. radiata. On the other hand, when accessions of V. radiata var. radiata were mixed together and digested with CEL I relatively few SNPs and no INDELS were detected. EcoTILLING was utilized to identify polymorphisms in a collection of mung bean, which previously showed limited molecular genetic diversity and limited morphological diversity in the flowers and pod descriptors. Overall, EcoTILLING proved to be a powerful genetic analysis tool providing the rapid identification of naturally occurring variation. Mung bean (2n = 2x = 22) , also commonly known as green gram or golden gram is classified as Vigna radiata (L.) R. Wilczek in the family Fabaceae and placed in the tribe Phaseoleae. Several of the 200 species classified in the genus Vigna (including mung bean) are important economic crops that are grown worldwide especially in developing countries in which soil fertility and water are limiting factors. Vigna species, in many countries, are used as dietary staples, forage, cover, and green manure crops . The USDA-ARS Plant Genetic Resources Conservation Unit (PGRCU) maintains a germplasm collection that has, as part of its collection, 22 different Vigna species. V. radiata was chosen as the target species for this study because it is mainly a self-pollinated diploid species with a small nuclear genome size of approximately 520 Mb/1C . The USDA-ARS PGRCU Vigna radiata core collection has been evaluated for various morphological characters, but has not been extensively evaluated for molecular genetic variation. The major morphological differences between V. radiata var. sublobata and V. radiata var. radiata are the kidney shaped glossy seeds, lobed leaflets, plants prostrate or twining and flowers borne on racemes and opposed in sublobata compared to globose seeds, leaflets not lobed, plants erect and not twining and single flowers of radiata (J. Wiersema, personal communication). Some of the V. radiata var. radiata core accessions and one reference plant, V. radiata var. sublobata, were previously evaluated with SSR markers and morphological descriptors, both of which showed limited genetic diversity (Gillaspie et al, unpublished data). Therefore, the purpose of this study was to further assess V. radiata accessions for molecular polymorphisms via EcoTILLING and furthermore evaluate the EcoTILLING method for rapid detection of SNPs in plant germplasm. TILLING (Targeting Induced Local Lesions in Genomes) is a fairly new, innovative, molecular technique that allows rapid identification of induced mutations in a population. This method is a reverse genetics approach that allows scientists to rapidly screen for mutations in a gene of interest without the creation of transgenic material [4, 5]. EcoTILLING is a molecular technique that is similar to TILLING, except that it targets natural genetic variation as opposed to induced mutations. This approach allows one to rapidly screen through samples to identify naturally occurring SNPs or small INDELS in a gene of interest. EcoTILLING reduces a scientist's time and effort by weeding out identical haplotypes, and thus, ultimately does not require sequencing all of the individuals in a population to identify polymorphisms. This technique has not been as widely employed as TILLING; however, there are a few published studies on EcoTILLING in plants. This technique was first applied in Arabidopsis to uncover 55 haplotypes in five different genes . EcoTILLING was also used to examine DNA variation in populations of black cottonwood (Populus trichocarpa) in nine genes and SNPs were detected in all genes examined . Another study utilized EcoTILLING to screen for allelic variation for disease resistance in various Cucumis species . Overall, this modified TILLING method has proven to be beneficial to identify natural genetic variation in a gene of interest and to mine for SNPs in plants. The approach for EcoTILLING in mung bean was to mix DNA from a single reference plant V. radiata var. sublobata with that of each member of the population (V. radiata var. radiata) and mine for polymorphic sites (Table 1). The progenitor, V. radiata var. sublobata was chosen as the reference to ensure that polymorphisms between radiata and sublobata would be detected, since intravarietal polymorphisms of radiata had been previously difficult to detect with SSR markers. The ten primer sets (Table 2) chosen for this study were designed from Vigna radiata sequences deposited in GenBank that were mainly intron spanning targets, which should provide more DNA polymorphisms compared to highly conserved genes where polymorphic sites may be minimal. Intron spanning targets are ideal when assessing polymorphism in a species with high genetic identity. Taxonomic classifications of samples used in this study were determined from the NPGS (National Plant Germplasm System) GRIN database (Germplasm Resources Information Network). Accessions in this study are currently classified as either V. radiata, V. radiata var. radiata, or V. radiata var. sublobata. Five accessions (PI: 381150, 473636, 478618, 517909, and 526222) included in this study have yet to be classified past the species level. A list of the primer sequences including annealing temperature (ATM) and final MgCl2 concentration (mM) that were used for PCR in this study. The majority of the PCR fragments used are intron spanning (IS); however, some are unknown. EcoTILLING was performed by amplifying DNA from the fragment of interest in a two fold pooled format, form a heteroduplex from the PCR products by heating (denaturing) and cooling (annealing), applying the endonuclease enzyme CEL I to digest mismatches such as SNPs and INDELS in the heteroduplex, and detect any digested fragments by separation on a LI-COR 4300 DNA analysis system (Additional file 1). Additionally, members of the population were mixed together in a 1:1 ratio to detect intravarietal DNA polymorphisms among V. radiata var. radiata, since previous work has shown limited genetic diversity. (All intervarietal combinations and ~25% of the total possible intravarietal combinations were carried out in this study). Once variant pools with cleaved fragments were identified, samples were subsequently verified by bidirectional sequencing. Overall, the objectives of this work were to reveal variation among V. radiata var. radiata accessions and its progenitor V. radiata var. sublobata, mine for SNPs among V. radiata var. radiata accessions, and determine the number of different haplotypes in the collection. A total of 45 haplotypes ranging from simple to complex were produced from 10 primer sets (Table 2). DNA polymorphisms were observed in every intervarietal pool at each marker examined. The banding pattern of cleaved fragments when digesting heteroduplexes of V. radiata var. sublobata (reference) and V. radiata var. radiata (population) tended to be nearly identical when comparing adjacent gel lanes. This suggests that although there are numerous DNA polymorphisms between these two varieties, the radiata accessions in this collection are genetically similar and tended to share the exact same sites of variation when pooled with the reference sublobata. 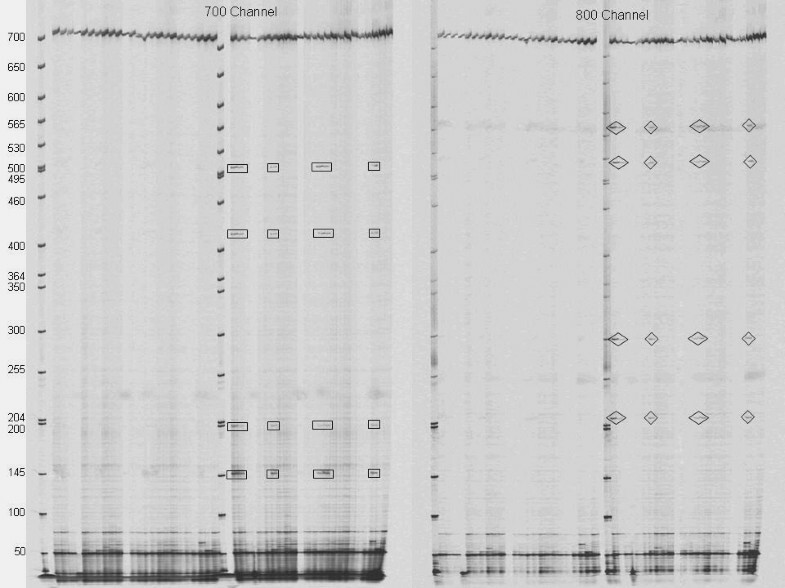 Sequencing positive samples verified the DNA polymorphisms detected by EcoTILLING and revealed a fairly low GC content in all the PCR fragments examined. The mean GC for all 10 primer sets was 36%. Approximately 162 kb of DNA was analyzed via EcoTILLING. The primer sets yielded products ranging from 408 bp to 1109 bp. In general, as the size of the target increased so did the number of DNA polymorphisms detected. The number of DNA polymorphisms ranged from five to 27 in AIGP and BTF3b, respectively (Table 3). The mean number of SNPs and INDELS detected per marker was 13.1 and 2.6, respectively. Overall, 157 DNA polymorphisms were detected when comparing V. radiata var. sublobata and V. radiata var. radiata with a mean of 15.7 polymorphisms per marker. The location and type of DNA polymorphisms (SNP/INDEL) observed between sublobata and radiata are diagramed in Figure 1. The number of SNP and INDELS detected at each marker between V. radiata var. sublobata and V. radiata var. radiata. Total number of SNPs and INDELS are also listed for the putative exon and intron segments determined by high BLAST similarity for each primer set. Map of DNA polymorphisms. Map of approximate location of the SNPs and INDELS from each of the 10 primer sets examined as determined by EcoTILLING and verified via sequencing. The shape represents the base that was in the reference plant V. radiata var. sublobata (A = ; C = ; G = ∆; T = ◊). The color represents the base that was observed in one of the members of the population V. radiata var. radiata (A = green; C = blue; G = yellow; T = red). INDELS are represented by symbol. Lastly, when comparing the sequence of V. radiata var. sublobata and V. radiata var. radiata if two bases in a row were different then a symbol was placed on the map. The boxes represent areas of the DNA sequence that had high sequence similarity (> 93%) to ESTs, cDNAs or genes deposited in NCBI from Vigna species or close relatives such as Phaseolus or soybean. The sequence data was used to determine similarity to exons and known genes by BLAST to the non human, non mouse expressed sequence tag (EST) database of NCBI. Most of the examined fragments had regions that had high similarity (>93%) to previously characterized genes, cDNAs, or ESTs from Vigna species or close relatives such as Phaseolus, suggesting that some of these fragments may contain exons to various genes of interest. The putative exon regions targeted exhibited as expected very few SNPs or INDELS (Table 3 and Figure 1). 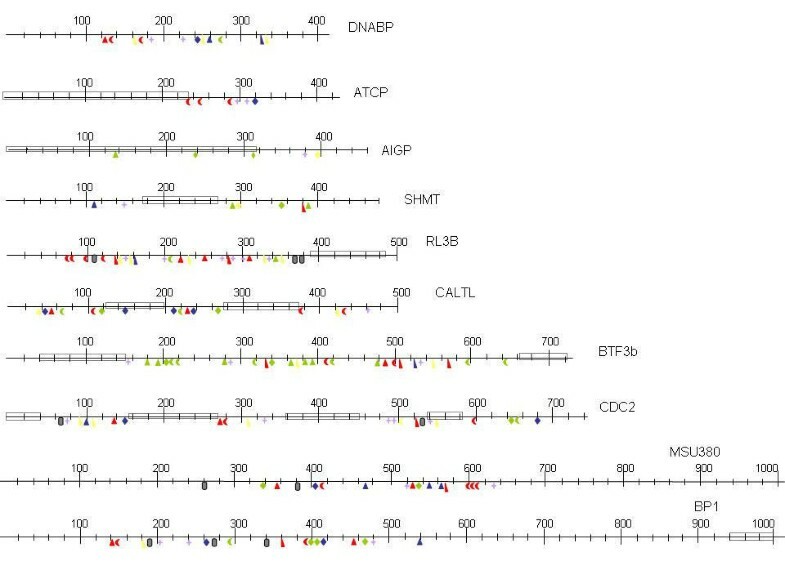 AIGP had the highest number of SNPs detected in a putative exon region followed by CDC2 and CALTL with 3, 1, and 1, respectively. (The exons of AIGP, CDC2 and CALTL were similar to deposited expressed sequences derived from Glycine max auxin-independent growth promoter, Phaseolus cyclin dependent protein kinase, and Phaseolus calreticulin, respectively). CDC2 was the only marker that had an INDEL detected in an exon. As expected, most of the variation detected came from regions that did not have high similarity to known genes or exons. Further studies will need to be performed to verify if these regions contain exons to genes of interest. The high level of polymorphism observed between sublobata and radiata may be due to the fact that the sequence surveyed was mainly non-coding regions and thus, one would expect a higher level of variation due to a lack of selective pressure that is often observed to conserve critical housekeeping genes. Targeting introns also yielded higher levels of DNA polymorphisms (SNPs) and less constraint than conserved exon regions in a study evaluating conserved intron scanning primers (CISP) from eight genera . Another possibility for the high polymorphism level is that the reference DNA V. radiata var. sublobata could have a high outcrossing rate, which would induce more genetic variation through shuffling of DNA ultimately leading to V. radiata var. sublobata substantially diverging from V. radiata var. radiata over evolutionary time. The rate of outcrossing for many of the species in the genus Vigna has yet to be determined. Currently, the USDA-ARS Vigna germplasm collection only contains one accession of V. radiata var. sublobata. In a previous study of 115 V. radiata var. sublobata accessions, a wide range of diversity was identified for agronomic and adaptive traits especially among accessions collected from remote locations . Intravarietal genetic diversity for sublobata has also been reported to be high, and furthermore, the Australian form of sublobata is considered to be more distantly related to cultivated radiata than varieties from Madagascar . Given that only one accession of V. radiata var. sublobata was available from the USDA germplasm collection with incomplete passport data, it is possible that this accession could be highly divergent from other V. radiata var. sublobata germplasm and thus, represent more wild type traits. Further work needs to be done to acquire and expand the USDA collection of V. radiata var. sublobata to look at the possibility and the range of divergence in morphological and genetic traits. DNA of V. radiata var. radiata was mixed together in two fold pools to detect intravarietal SNPs and INDELS via EcoTILLING since V. radiata var. radiata has been shown previously to have limited genetic diversity. Very few SNPs were detected when mixing the population together as compared to pooling V. radiata var. sublobata (reference) to V. radiata var. radiata. A total of 52 SNPs were identified and no INDELS were observed among the V. radiata var. radiata pooled accessions. Marker BTF3b had the most variant pools when comparing V. radiata var. radiata with 10 positive pools (Figure 2). 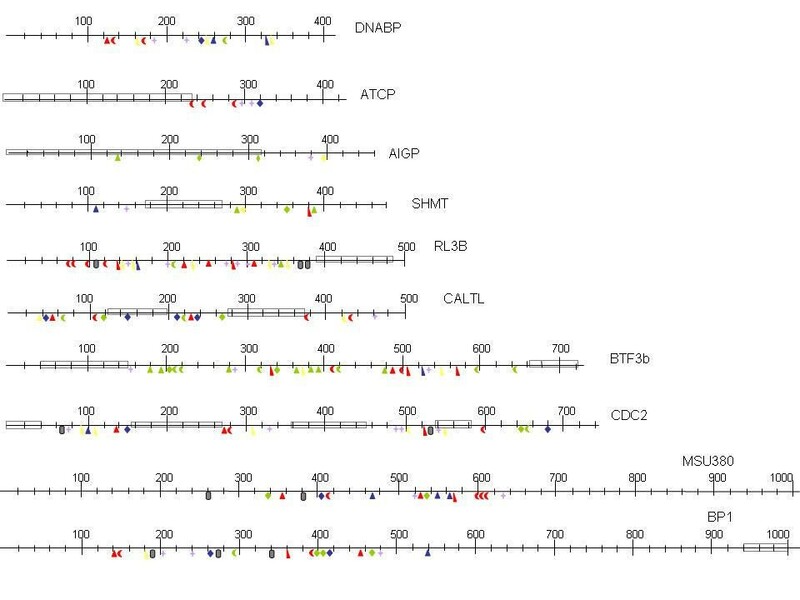 Four SNPs all at the same position in ten different 2 fold pools were detected in a 729 bp sequence for primer set BTF3b. Markers CDC2 and ATCP also had one and two positive pools with two and three SNPs, respectively. Overall, only 4.1% of the total V. radiata var. radiata accessions sampled displayed variant pools. However, due to limited time and resources not every possible combination of the population (276 two fold pools for each of the 10 markers) was mixed together so it is possible that some of the SNPs between V. radiata var. radiata were missed. Future work may include evaluating more intravarietal SNPs for radiata accessions. Since polymorphisms were fairly low for most of the primer sets examined, the number of samples in the pool could be increased to enhance throughput and reduce the overall cost. EcoTILLING image. LI-COR image of EcoTILLING with V. radiata var. radiata pooled with V. radiata var. radiata accessions in a 1:1 ratio and amplified with marker BTF3b along with a 50–700 bp ladder. Six of the ten positive pools that were identified for this primer set are shown in this image with the cleaved fragments marked. Overall, the EcoTILLING method proved to be successful in detecting SNPs and INDELS among V. radiata var. sublobata (the reference) and members of the population (V. radiata var. radiata) with numerous polymorphic sites detected at all ten markers examined. However, polymorphisms were less frequent between V. radiata var. radiata accessions suggesting that these accessions have limited genetic diversity. This lack of polymorphism was also observed in a SSR study (Gillaspie et al. unpublished data). It is possible that V. radiata var. radiata generally has a narrow genetic base or that the collection at USDA-ARS PGRCU needs to be further expanded. Future studies may include developing SNP markers from this data, which can be advantageous for marker assisted selection (MAS) in breeding for specific traits. In general, this method was a powerful tool to uncover SNPs and their approximate location without having to sequence all individuals in the population. This technique is especially useful when working with plants that have a narrow genetic base such as V. radiata var. radiata or looking for variation in highly conserved genes. We are grateful to Drs. Peggy Akins-Ozias and Lilian Miranda for their comments to improve this manuscript. We also thank Mr. James Chalkley and Ms. Nancy Tingle for their help in germination, harvesting, collecting morphological descriptors, and Ms. Meredith Reed for assistance in DNA extraction. NAB: EcoTILLING data acquisition, data analysis, and manuscript drafting; MLW: project conception, study design, and manuscript drafting; AGG: sample selection, morphology data, and SSR genotyping; RED: concept design and manuscript drafting; GAP: concept design and manuscript drafting; TMJ: data acquisition, sequence alignments, and manuscript drafting.